I think even the most diehard, hopeful fan would admit that Theme Time Radio Hour is over. Sirius XM shows no sign of ending the re-runs, although I suspect one Wednesday we'll tune in and the show will have been replaced with "The Wit & Wisdom of Tom Waits" or something. But over or not, there are still many things to document about TTRH, and we expect to be around for a while longer. One of the things that has always delighted us about Theme Time was how it inspired so many people in so many ways. Over the past three years, we've heard more than a half-dozen hommages to the show, using anything from reggae to Canadian artists to movies to Bob Dylan's own work as source material. Many were as good as any episode of TTRH. We've seen the show, its artists, the music - even jokes and recipes - all artfully documented. And several fans have created "cover art" for the episodes, including my favorites from a fan who calls himself simply "Man-on-the-Street." MotS has updated and uploaded all 100 of his TTRH "Polaroids" on Flickr. Whether you use them as CD cover art or not, you'll want to take a look at the collection if you're a TTRH fan. Many of the 100 covers are very funny visual puns, worthy of the show itself. 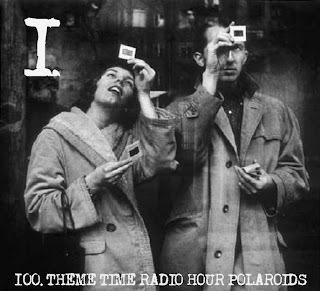 If the TTRH team wander across the 100 Theme Time Radio Hour Polaroids at some time, I think they'll be pleased with what they inspired.